A list of the new Wintersday recipes introduced by the GW2 Wintersday event. These recipes are permanent in-game additions and here to stay after the Wintersday event. This list is a work in progress, feel free to contribute any missing recipes. 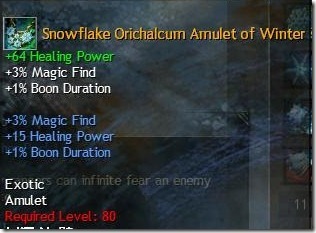 GW2db tooltips will be provided when they become available. NOTE: You can now buy any of the toy frames for 250 ugly sweater/hat/gloves etc so if you used up the frames for making a mini and want to get the tonic, here is your chance. All Ice creams give +5% karma. Recipes are acquired via discovery part of the crafting menu. Note: If you are looking for the sigil of generosity, these cannot be crafted and obtained as random drops from the Wintersday gifts etc. Giver’s Intricate Gossamer, Embroidered Silk Insignia, and Embroidered Linen Insignia cannot be discovered – you must acquire these Insignias recipes first but the lower level ones (Embroidered Jute, Wool, and Cotton) can be discovered. Similarly, Giver’s Orichalcum Imbued, Mithril Imbued, and Darksteel Imbued Inscriptions requires you getting these recipes first while Giver’s Green Inscriptions, Steel-Plated Inscriptions, and Iron-Plated Inscriptions can be discovered. 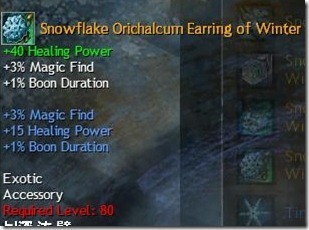 These can be acquired randomly from the Giant Wintersday Gift/Large Wintersday Gift or brought from the Gift Exchange vendor near Mystic Forge in LA for 200 Ugly Wool Socks, 175 Ugly Wool Hats or 150 Ugly Wool Sweaters. Alternatively, search for them on the trading post. Recipes for those are obtained via the discovery part of crafting menu. It looks like you’re missing a recipe that takes 1 Glacial Sliver, 15 Chocolate Bars, and 3 Bowls of Ice Cream Base. That makes 3 Bowls of Chocolate Chip Ice Cream. There are also a number of insignia and inscription recipes. On the Trading Post, check the search filter “Recipe: Giver” to get the list. They appear to have similar stats and qualities as the jewelry. Is there a recipe for Superior Sigil of Generosity? I purchased the Tailor recipe “Giver’s Intricate Silk Insignia” from the TP and learned it, and my history shows me as knowing it, but when I look at my Insignia list it doesn’t show up. It’s the yellow insignia that requires 375 skill. Any ideas? The drop rate on the endless tonics must be pretty high. I got the Princess one on the first try, and quite a few other folks are also reporting success. I got the small gift box only.. and my frame is gone.. Your gift box will contain the frame again. I have a general question about on healing skill runes like altruism. 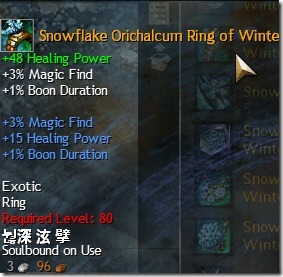 Do they proc on any heal (like skill affects or altruistic healing) or just on the 6 healing skill? Thanks! You can buy frames now using ugly socks, hats, or sweaters.